A candleholder project in the popular bear and penguin theme. Use as a table centerpiece or to decorate a side table or fireplace mantel. Plans drawn FULL SIZE. 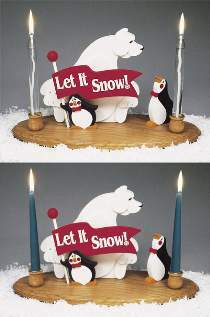 Base measures 18"L. Use your own tapered candles or order #1081 Polar Bear & Penguins Hardware which includes two oak candle cups with decorative brass inserts, two 8” glass oil candle sticks, 1” pre-drilled wood ball, dowel and “Let It Snow!” decal. #1082 Special includes the plan and #1081 Hardware.